Tasty Planet's little germ is cute now, but it puts on size until it could frighten Galactus. Tasty Planet is one of the less abstract browser-based games in the ambient genre. This game is similar in spirit to Katamari Damacy, a popular title released for Playstation 2 in 2004. You begin your adventure as a small germ, and your goal is to eat everything that is smaller than you are while avoiding anything that is bigger. As the game goes on, you grow larger and larger, and go through several levels of eating progressively bigger things. You start off eating tiny bacteria, and end up devouring whole planets (and more). 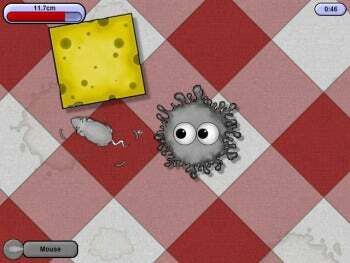 The game is available as a paid download for Windows, Mac and iPhone, but you can also play it in your browser for free on Kongregate.